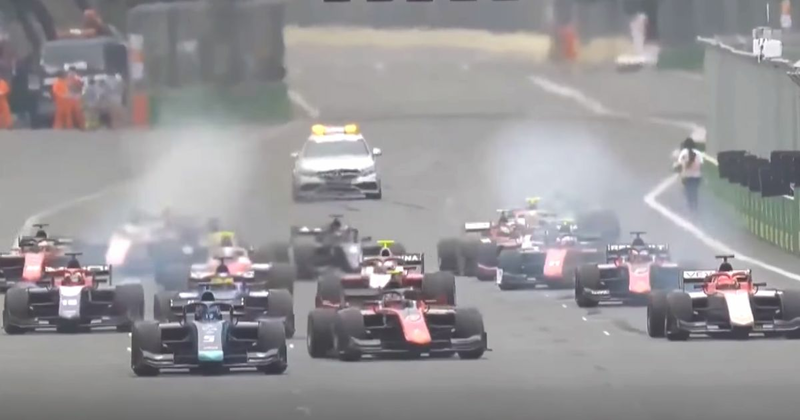 Formula 2 races are always dramatic and there’s something about Baku that just heightens the drama. There was plenty of action on the opening lap with drivers stalling, a battle for the lead, and a crash for Luca Ghiotto coming onto the pit straight bringing out the safety car. The race got underway again and George Russell snatched the lead from Alexander Albon during the pit stops before pulling out a massive lead. Things settled down a bit until Roy Nissany, running a great race up in fifth, stuffed his Campos into the wall, leading to a great bit of team radio. That brought out another safety car, completely slashing Russell’s lead. That put him under threat from Nyck de Vries and, as is tradition at Baku, the restart descended into chaos. WATCH: Drama at the restart as the leaders take each other off down at Turn One! "Standard De Vries," says Russell. "You've 12 laps and he makes a hero move on lap one." With de Vries and Russell out of the picture Antonio Fuoco (who qualified 14th!) took the lead and built a small gap, but then Artem Markelov’s car blew its engine in a big way. That plunged the narrowest part of the circuit into smoke. Fuoco backed off, allowed Albon to catch up and he duly made a clean pass for the lead heading into the first corner. Albon went on to take his first F2 victory whilst Fuoco lost a further place to our very own Jack Aitken, who’s amazing come through from the pit lane after being one of the stallers at the start. Lando Norris finished sixth after stalling on the formation lap, whilst Nicolas Latifi ended up fifth having started dead last. Definitely a good day not to be starting from the front - well, except for Albon!